In early 1795, relations between the United States and France improved and the initial impetus to fortify Norfolk lost its urgency (Clary 1990:24). By May 1795, Fort Norfolk's garrison was deployed not to defend the town against French men-of-war, but to waylay incoming West Indian cargo ships carrying passengers infected with yellow fever. Thomas Newton, Sr., the collector for the port, reported that ships entering Norfolk harbor were brought "under the guns of the Fort for examination." Fort Norfolk's medical officer, one Dr. Brewster, would board the vessels escorted by troops from the post. Newton required that a ship arriving in Norfolk had to be 20 days out her previous port with no sign of the disease "before she is allowed to come up" (CVSP VII:466, 483). By mid-May 1795, the federal troops at Fort Norfolk had been ordered to West Point, New York. They were due to be replaced by state militia. A Virginia militia officer in Norfolk had learned of the transfer from Major Rivardi and quickly petitioned the governor for assignment to the vacant post. Green's company of artillery requested "duty at Fort Norfolk in preference to Fort Nelson" because of the convenience of "having no water to cross" (CVSP VII:502-503). 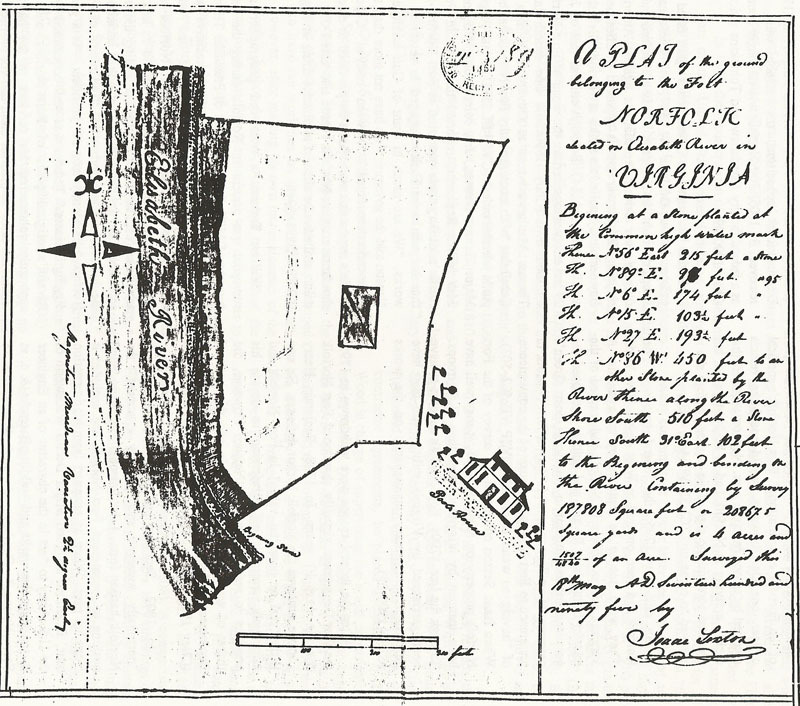 When Isaac Sexton conducted his survey of the Fort Norfolk property on May 18, 1795, it may well have been manned by Virginia rather than U.S. troops. Through the late 1790s, Fort Norfolk appears to have been garrisoned by Virginia militia who may have performed rudimentary maintenance on the works (Clary 1990:25).